Ryan Betts, Cloud Solutions Architect: Hyper-V 2012 R2 "The operation failed. 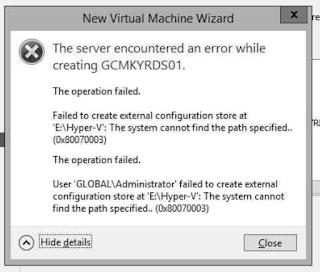 Failed to create external configuration store at local path: The system cannot find the path specified...(0x80070003)"
Hyper-V 2012 R2 "The operation failed. 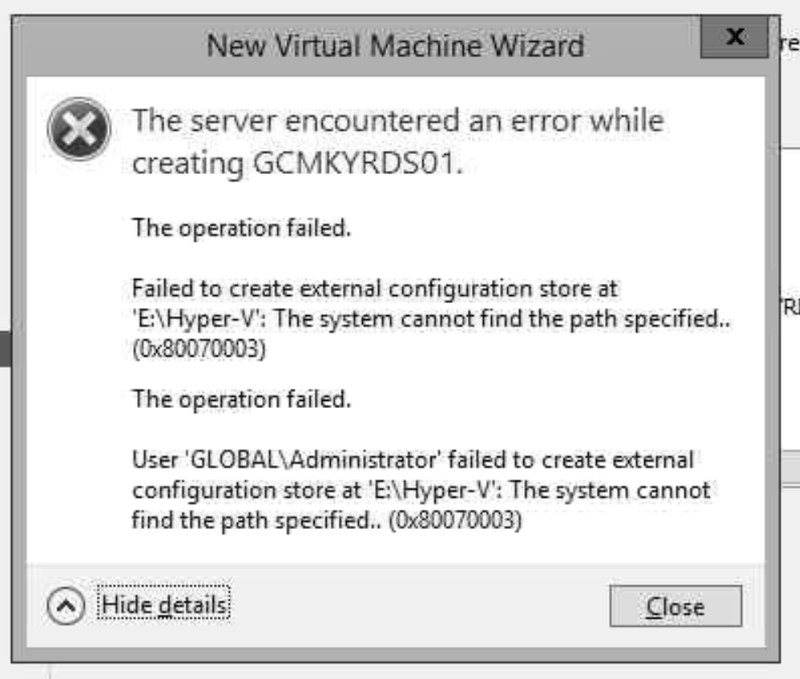 Failed to create external configuration store at local path: The system cannot find the path specified...(0x80070003)"
When you try to create a new VM using either Failover Cluster Manager or the Hyper-V Manager you get the following error when you click Finish to actually create the VM. In this environment the new VM function was working correctly last week. It is a simple fix but it took me a while to work out why it suddenly started happening. It turns out it was related to the Hyper-V Settings and the default location for Virtual Machines. In this example I was using a two node Hyper-V Cluster with shared storage. It seems that if you have the default Virtual Machines location set to a local path you will get the 0x80070003 error. When I was trying to create the new VM, I was pointing it to a LUN hosted on a HP StorVirtual. After I set the default Virtual Machine path to point to the same shared storage it worked correctly.